Here we demonstrate that a mode-locked ytterbium fiber laser for two-photon fluorescence microscopy can be built for $13,000. The laser emits at a wavelength of 1060 nm with a usable average power of 1 W at a repetition rate of 40 MHz and a compressed pulse width of 81 fs at the sample. The laser is used to obtain deep in vivo two-color images of layer-V pyramidal neurons expressing YFP and vasculature labelled with Texas Red at depths up to 900 µm. The sub-1 µm features of dendritic spines can be resolved at a 200 µm depth. J. Grutzendler, N. Kasthuri, and W.-B. Gan, “Long-term dendritic spine stability in the adult cortex,” Nature 420(6917), 812–816 (2002). M. Matsuzaki, N. Honkura, G. C. R. Ellis-Davies, and H. Kasai, “Structural basis of long-term potentiation in single dendritic spines,” Nature 429(6993), 761–766 (2004). M. Drobizhev, S. Tillo, N. Makarov, T. E. Hughes, and A. Rebane, “Absolute two-photon absorption spectra of orange and red fluorescent proteins,” J. Phys. Chem. B 113, 855–859 (2009). K. Taira, T. Hashimoto, and H. Yokoyama, “Two-photon fluorescence imaging with a pulse source based on a 980-nm gain-switched laser diode,” Opt. Express 15(5), 2454–2458 (2007). R. Kawakami, K. Sawada, A. Sato, T. Hibi, Y. Kozawa, S. Sato, H. Yokoyama, and T. Nemoto, “Visualizing hippocampal neurons with in vivo two-photon microscopy using a 1030 nm picosecond pulse laser,” Sci. Rep. 3, 1014 (2013). C. Xu and F. W. Wise, “Recent advances in fibre lasers for nonlinear microscopy,” Nat. Photonics 7(11), 875–882 (2013). M. E. Fermann and I. Hartl, “Ultrafast fibre lasers,” Nat. Photonics 7(11), 868–874 (2013). D. U. Kim, H. Song, W. Song, H.-S. Kwon, M. Sung, and D. Y. Kim, “Two-photon microscopy using an Yb(3+)-doped fiber laser with variable pulse widths,” Opt. Express 20(11), 12341–12349 (2012). 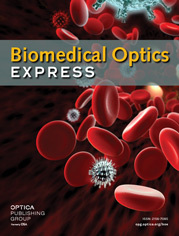 J. R. Unruh, E. S. Price, R. G. Molla, L. Stehno-Bittel, C. K. Johnson, and R. Hui, “Two-photon microscopy with wavelength switchable fiber laser excitation,” Opt. Express 14(21), 9825–9831 (2006). S. Tang, J. Liu, T. B. Krasieva, Z. Chen, and B. J. Tromberg, “Developing compact multiphoton systems using femtosecond fiber lasers,” J. Biomed. Opt. 14(3), 030508 (2009). A. Chong, W. H. Renninger, and F. W. Wise, “All-normal-dispersion femtosecond fiber laser with pulse energy above 20 nJ,” Opt. Lett. 32(16), 2408–2410 (2007). J. An, D. Kim, J. W. Dawson, M. J. Messerly, and C. P. J. Barty, “Grating-less, fiber-based oscillator that generates 25 nJ pulses at 80 MHz, compressible to 150 fs,” Opt. Lett. 32(14), 2010–2012 (2007). K. Kieu, W. H. Renninger, A. Chong, and F. W. Wise, “Sub-100 fs pulses at watt-level powers from a dissipative-soliton fiber laser,” Opt. Lett. 34(5), 593–595 (2009). M. Hofer, M. E. Fermann, F. Haberl, M. H. Ober, and A. J. Schmidt, “Mode locking with cross-phase and self-phase modulation,” Opt. Lett. 16(7), 502–504 (1991). A. Chong, W. H. Renninger, and F. W. Wise, “Properties of normal-dispersion femtosecond fiber lasers,” J. Opt. Soc. Am. B 25(2), 140 (2008). C. V. Shank, R. L. Fork, R. Yen, R. H. Stolen, and W. J. Tomlinson, “Compression of femtosecond optical pulses,” Appl. Phys. Lett. 40(9), 761–763 (1982). C. Xu, J. Guild, W. Webb, and W. Denk, “Determination of absolute two-photon excitation cross sections by in situ second-order autocorrelation,” Opt. Lett. 20(23), 2372 (1995). S. M. S. Kazmi, A. J. Salvaggio, A. D. Estrada, M. A. Hemati, N. K. Shaydyuk, E. Roussakis, T. A. Jones, S. A. Vinogradov, and A. K. Dunn, “Three-dimensional mapping of oxygen tension in cortical arterioles before and after occlusion,” Biomed. Opt. Express 4(7), 1061–1073 (2013). C. J. Schrandt, S. M. S. Kazmi, T. A. Jones, and A. K. Dunn, “Chronic monitoring of vascular progression after ischemic stroke using multiexposure speckle imaging and two-photon fluorescence microscopy,” J. Cereb. Blood Flow Metab. 35(6), 933–942 (2015). F. Bestvater, E. Spiess, G. Stobrawa, M. Hacker, T. Feurer, T. Porwol, U. Berchner-Pfannschmidt, C. Wotzlaw, and H. Acker, “Two-photon fluorescence absorption and emission spectra of dyes relevant for cell imaging,” J. Microsc. 208(2), 108–115 (2002). E. Spiess, F. Bestvater, A. Heckel-Pompey, K. Toth, M. Hacker, G. Stobrawa, T. Feurer, C. Wotzlaw, U. Berchner-Pfannschmidt, T. Porwol, and H. Acker, “Two-photon excitation and emission spectra of the green fluorescent protein variants ECFP, EGFP and EYFP,” J. Microsc. 217(3), 200–204 (2005). E. Beaurepaire, M. Oheim, and J. Mertz, “Ultra-deep two-photon fluorescence excitation in turbid media,” Opt. Commun. 188(1-4), 25–29 (2001). A. Schönle and S. W. Hell, “Heating by absorption in the focus of an objective lens,” Opt. Lett. 23(5), 325–327 (1998). N. Nishimura, C. B. Schaffer, B. Friedman, P. S. Tsai, P. D. Lyden, and D. Kleinfeld, “Targeted insult to subsurface cortical blood vessels using ultrashort laser pulses: three models of stroke,” Nat. Methods 3(2), 99–108 (2006). N. G. Horton, K. Wang, D. Kobat, C. G. Clark, F. W. Wise, C. B. Schaffer, and C. Xu, “In vivo three-photon microscopy of subcortical structures within an intact mouse brain,” Nat. Photon. 7, 205–209 (2013). S. Lefrançois, K. Kieu, Y. Deng, J. D. Kafka, and F. W. Wise, “Scaling of dissipative soliton fiber lasers to megawatt peak powers by use of large-area photonic crystal fiber,” Opt. Lett. 35(10), 1569–1571 (2010). M. Baumgartl, F. Jansen, F. Stutzki, C. Jauregui, B. Ortaç, J. Limpert, and A. Tünnermann, “High average and peak power femtosecond large-pitch photonic-crystal-fiber laser,” Opt. Lett. 36(2), 244–246 (2011). Fig. 1 Schematic of the mode-locked ytterbium fiber laser. The majority of the cavity lies within 4.8 meters of optical fiber. A free space portion is used to eject the pulses with a polarizing beam splitter (PBS). Half-wave and quarter-wave plates control the polarization rotation effect which initiates and sustains mode-locking. The birefringent filter plate (BRF) allows control of the spectral bandwidth in the cavity. G1 and G2 are transmission pulse compression gratings, PM is pick-off mirror, C1 and C2 are fiber collimators. Fig. 2 (a) Emission spectrum of the mode-locked ytterbium laser. (b) Autocorrelation trace of the compressed pulse at the sample measured by in situ autocorrelation. The measured pulse width was found to be 127 fs full-width half max. Assuming a sech2 pulse shape, the estimated pulse width is 81 fs. (c) Zoomed view of autocorrelation trace. Fig. 3 (a) Custom two-photon instrument schematic. SL: scan lens, TL: tube lens, DM1, DM2, DM3: dichroic mirrors with transmission lines: T > 775 nm, T > 570 nm, and T > 795 nm, respectively (b) Laser speckle contrast image of the mouse craniotomy. The scale bar is 800 µm. (zoomed view: a representative two-photon maximum intensity z-projection of a 400 × 400 × 200 µm3 stack. The vessels are perfused with Texas Red. Fig. 4 (a and b) Image stack of dimensions 400 × 400 × 750 µm3 taken with two-photon laser scanning microscopy labeling for (a) microvasculature with Texas Red, and (b) Neurons expressing YFP. (c) 2D z-projections at various depths through the stack, the image at each plane is a maximum intensity projection of the nearest 10 µm. Fig. 5 (a) Deep imaging comparison between a commercial Ti:S laser tuned to 920 nm and the custom built 1060 nm fiber laser. Image dimensions 400 × 400 × 900 µm3. Fluorescence stacks are pyramidal neurons expressing YFP taken in two separate mice. (b) A zoomed in view of a dendrite at 200 µm depth taken with the fiber laser. Single dendritic spines can be visualized with sub 1 µm features. Scale bar is 8 µm. (c) An image of pyramidal neuron bodies at 900 µm depth taken with the fiber laser. (d) An image at 900 μm depth taken with a commercial Ti:S laser, neuron structures cannot be resolved. 1064 nm, FC/PC Fiber Collimation Pkg.